The image — a then and now comparison — can be enlarged. The building has lost its handsome 19th century window with coloured glass surround, and its ground floor windows on this side are no longer used as shop windows. On the corner, grey metal posts for traffic signs replace the postbox. The trade directories reveal that this shop sold clothing for many years. Fancy clothing even. In the 1920s the proprietors were the Boultons, ‘fancy drapers and blouse specialists’. Then, in 1930, G Peirson, also a draper. The photos, from an old family album, were sent to me by Ian, a grandson of the Peirsons. He thought they hadn’t been here in York for long, before moving to Leeds. The trade directories suggest that G Peirson was the owner for just that one year. The 1931 directory lists the proprietor as Charles Dixon. Not only did the Peirsons capture a view of the side windows of their shop during their time in York, but their family album also records the view as it was then from their window, across Gillygate, towards the bar walls and the Minster. Presumably taken from the top floor of the building. 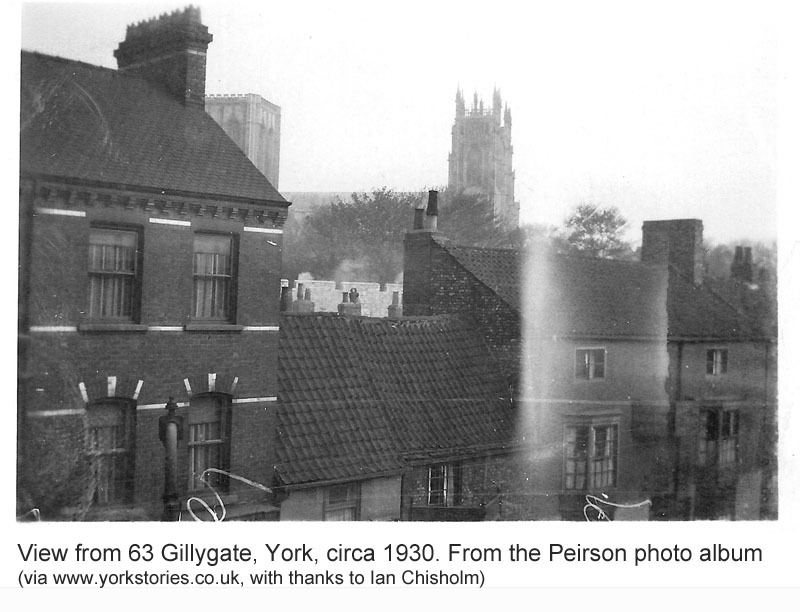 Obviously they wanted to record the image of the Minster and the walls, but of more interest is the foreground, Gillygate, as it’s changed a bit since this photo was taken. This photo too can be enlarged. 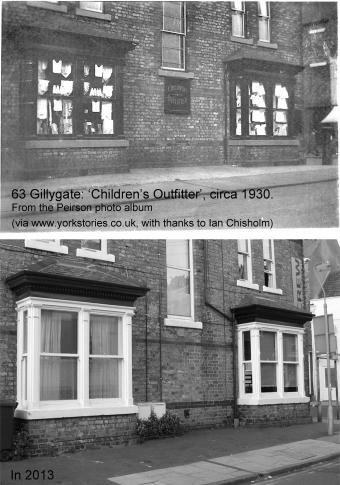 The building on the left of the photo is still on Gillygate, as is the much smaller one next to it. The small building adjoining that was removed at some point since, and is now an opening to the pub car park. 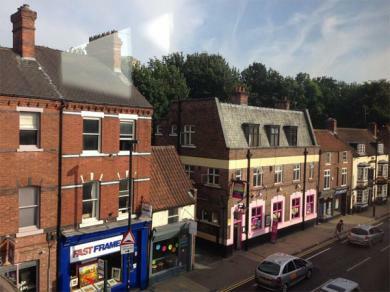 The pub, on the right, looks very different now. It was the Bay Horse. More recently the Pink Pony, and inbetween times Cert 18, Stereo (and in the 80s briefly called Gilly’s, if I remember correctly). The present pub looks like it was built in the 1930s, and it presumably replaced the building pictured in the 1930 photo. If you want to have a virtual wander around this area: Google Street View, Portland St/Gillygate corner.